Baby lotions are the best way to soothe a babies skin. They help to moisturize, sooth and protect delicate skin and nourish skin that may have rashes or need extra hydration. Baby lotions have been created to be hypoallergenic and harmless for your baby’s skin. Whether your baby has a nappy rash, eczema or needs their skin hydrating, baby lotions can provide all of this. Rub all over your baby’s body, in the affected areas and the rest of the body to provide a smooth, hydrated protection perfect for everyday use and especially after baths to retain hydration. Using normal moisturizers that you, as a parent may use, could cause problems to your little one’s skin. Babies are generally prone to skin irritations especially then using general moisturizers. This why there are so many baby lotions available as they are free of harmful chemicals and added ingredients that can be sensitive to babies skin. PWhat is the difference between moisture and hydrate? PHow do I know when to apply baby lotion to my baby? When buying baby lotion for your little one there are a number of features to consider to ensure you choose the right brand and type for your needs. Each baby lotion will differ so it is important to pay attention to the different features and work out which product will work out best for your baby. When you are choosing the best baby lotion for your baby, there are a number of things to consider. Firstly, what do you need the baby lotion for? Does your baby have a rash, irritation, cracking skin or flaking? If so, there are lots of baby lotions that provide extra support for these problems. All good quality baby lotions will help the prevention of these problems when used daily. This is why baby lotion is very popular and widely used by parents so that common problems like nappy rash or rashes can be prevented easily. There are a wide variety of different types of baby lotions brands available they may all differ and specify certain presentations however they will all help your baby’s skin to be smooth as a baby’s bottom! Baby lotion is best used immediately after your baby’s bath whilst their skin is still wet. This helps to keep the moisture from the bath in their skin and will also prevent the skin become too dry after a bath. Baths can often cause skin dryness and dehydration because a bath can drain the essential oils from the body causing the skin to dry out. Baby skin is much more delicate and sensitive than adult skin that is fully developed which is why it is important to keep their skin as hydrated and moisturize as possible. Why we like it: Cetaphil Baby Daily Lotion is a baby lotion that helps to moisture and protects your baby’s skin. It particular helps delicate and sensitive skin from dryness and rashes. The lotion has been formulated with organic and natural ingredients including almond and sunflower oil which help to smooth and soften the skin. Cetaphil Baby Daily Lotion has been designed to moisturize baby skin as well as protecting the skin from dryness, particularly for babies who have sensitive and delicate skin. Once the lotion has been applied to the body, it will gently soothe and soften the skin, helping to nourish and moisturize it. The lotion will leave your baby’s skin as smooth as a baby’s bottom! Moisturising is particularly important after a bath to retain moisture and Cetaphil Baby Daily Lotion can help to do this. As one of the leading lotions for helping dry skin, Cetaphil baby lotion is particularly useful in the winter months. Cetaphil Baby Daily Lotion is a very affordable baby lotion that is available on Amazon for $6.74 for a 13.5 fl. OZ. The lotion can be used on the face and body and provides moisture for devices skin or up to 24 hours. As the lotion is a daily lotion, it can be used on your baby’s body every day at a reasonable price. The price is a factor that needs to be taken into consideration when choosing a baby lotion to use and this is lotion is definitely one of the most affordable and high quality available on the market. 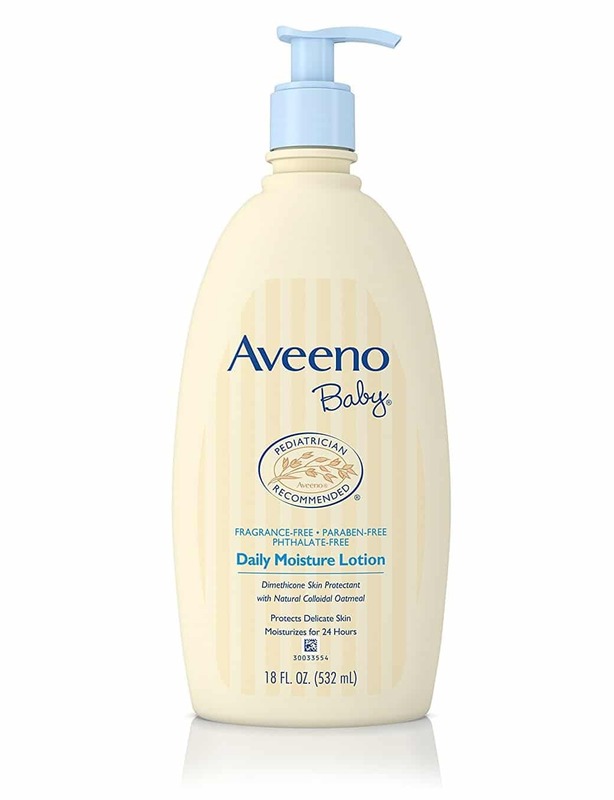 Why we like it: CAs a daily moisture lotion, Aveeno Baby provides 24-hour moisture for babies with sensitive skin. The lotion is fragrance-free, paraben free and phthalate free and specially formulated for babies with delicate and sensitive skin. Recommended by pediatrician and dermatologists, the lotion has no toxins, drying alcohol or fragrance which is perfect if you’re looking for a naturally formatted lotion for your baby’ss skin. The Aveeno Daily Moisture Lotion provides up to 24 hours moisture using a naturally blended formula containing colloidal oatmeal and dimethicone. The lotion helps to soothe and moisture delicate baby skin with a non-greasy formula which is hypoallergenic and fragrance-free, the lotion is a perfect everyday lotion for babies, particularly those who are prone to skin rashes and complications. Use for good skin or sensitive skin and see great results which will help improve your baby’s dry skin. The product is nut and dairy free which is ideal for any sensitive skin and babies who may be allergic or sensitive to these products. There is no worry for clogging pores on your baby’s skin as this lotion does not contain alcohol which is what usually causes this problem. Aveeno is a mid-range baby lotion that is affordable and available at most retailers in-store and online. Available on Amazon for $8.52 for an 18 fl. OZ bottle, this product is inexpensive and provides a daily moisture lotion for normal and sensitive skin. With a 4.5 overall rating on Amazon, this product is definitely worth a try. Why we like it: CeraVe Baby Lotion is a lotion that has been developed by dermatologists to help moisturize, protect and maintain baby’s delicate skin. It provides up to 24-hour moisture and is free from paraben, phthalates, and fragrance to provide a natural and healthy lotion for your baby’s skin. It has been accepted by the National Eczema Association which is a renowned association that only accepts products that work well for those with sensitive skin. The CeraVe Baby Lotion provides a temporary help to relieve sensitive skin from chafing, dryness and cracking, it is also a great help for skin conditions including eczema. This fragrance-free baby lotion is a high performing baby lotion that has been developed by dermatologists to help moisture the skin by protecting, maintaining and restoring the babies skin barrier. It uses a patented formulation which contains vitamins and 3 essential ceramics which are needed to help restore and maintain a natural protective barrier in the skin. Ceramides help hydration in the skin and restore and protect the skin barrier and all CeraVe products contain these essential ceramides to help the skin. This baby lotion provides up to 24 hours of moisture whilst also protecting and maintaining the skin with the addition of hyaluronic acid which helps retain the skin’s moisture. CeraVe Baby Lotion is available for $9.49 on Amazon for an 8 fl. OZ bottle which is quite high in comparison to similar products where you can get 27 fl. OZ bottles for less than $9. However, the price is still affordable for most customers and is worth the extra bucks to know you are using a reliable, fragrance-free product that will help your baby’s skin. Why we like it: Just Hatched has ‘no yucky stuff inside’ meaning it is safe for your baby’s soft and sensitive skin. This baby lotion is free of sulfate, paraben, phthalate, and gluten and is also hypoallergenic. Lightly scented with coconut milk, the lotion gives babies skin a beautiful scent to keep them smelling lovely all day. The lotion is gentle and helps to protect the skin whilst moisturizing and soothing it. Natural skin moisturizers and conditioners are combined with essential oils added to this lotion to help hydrate, soften and soothe the skin. Just Hatched Baby Lotion can is a great product for newborns and for sensitive skin as it helps to protect the most delicate skin without causing any irruption or problems. Just Hatched is a high performing baby lotion which combines natural skin conditioners and moisturizers with essential oils to create a formula that helps hydrate, soften and soothe baby skin. The lotion can be used to help protect the delicate skin of babies of all ages including newborns whilst not causing irritation. Using a water base, the lotion contains simple ingredients that your newborn’s skin needs. The skin is successfully hydrated without the use of harmful chemicals such as parabens and sulfates. The light scent of coconut from the soothing coconut milk will leave your baby with a beautiful smell. Just Hatched Baby Lotion is very affordable, at just $4.72 for 10.1 fl. OZ on Amazon, this lotion is one of the most affordable products on the market. It provides everything that a baby lotion needs to do whilst being at an affordable and inexpensive price. This is why Just Hatched is one fo the best baby lotions in 2018. Why we like it: Eucerin Baby is a recommended brand by dermatologist and pediatrician and is a gentle bay lotto that can be used every day on baby’s sensitive skin. the lotion is hypoallergenic and free of fragrances, drying alcohols, dyes, and parabens ensuring it is safe for use on all skin types. The addition of a pro-vitamin B5 (panthenol) helps to nourish and hydrate your baby’s skin. 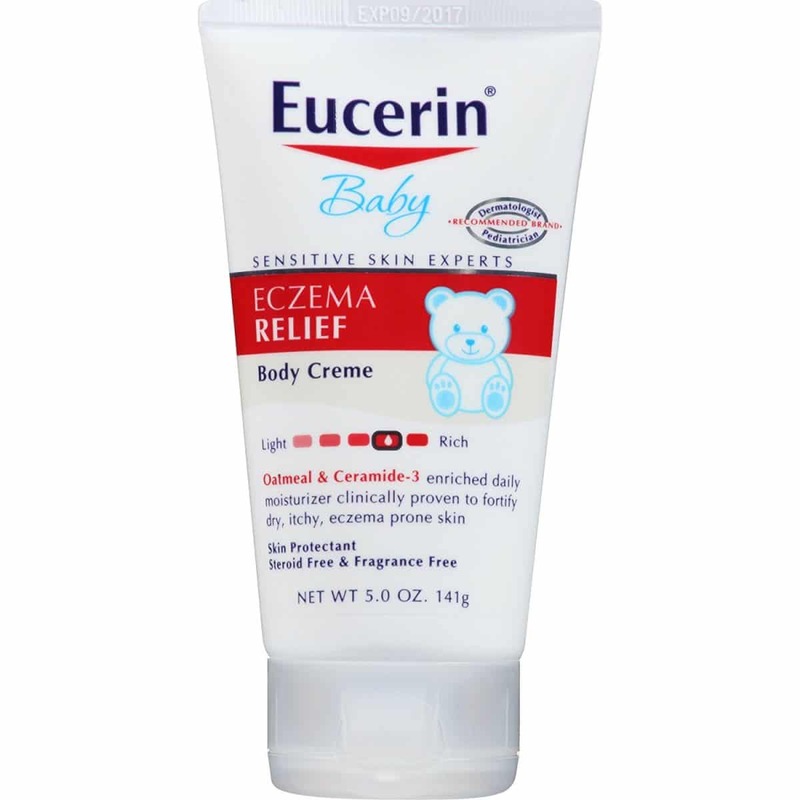 Eucerin Baby is particularly good for baby’s with eczema as it helps to moisture and protects the skin barriers and work as a great lotion for baby eczema and for baby acne. Eucerin Baby has been clinically proven to improve baby’s skin. Where your baby is suffering from dry, red, rashy, itchy or sensitive skin, Eucerin baby lotion can help improve and relieve it whilst also helping to improve hydration. The lotion has added natural shea butter which helps to soften and smooth your baby’s skin. Simply massage the lotion onto your baby’s skin on a daily basis or as often as required to help maintain moisture and help soothe sensitive skin. After your baby’s bath is the most important time to moisturize their body to help retain all moisture and hydration. Eucerin Baby is an affordable baby lotion that can be used as a daily lotion or used as and when needed. It is one of the leading brands that has been recommended by dermatologists and pediatricians for use to help soothe skin and help eczema in infants. The lotion is available on Amazon for $8.54 for 13.5 fl. OZ and can be used as a daily moisturizer for baby’s skin, particularly after baths. Why we like it: Earth Mama Organics Baby Lotion is a lotion specifically designed for babies to help moisture and sooth their skin. The lotion is organic and contains no petroleum, mineral oil or artificial fragrance and has been created with extra care to help combat dry and sensitive skin. It is a particular favorite because it provides a natural and organic lotion for your babies bodies that is safe and gentle to use. The fragrance-free baby lotion has unscented calendula which has no artificial fragrance which is safe for all skin types. The baby lotion by Earth Mama is certified to the NSF/ANSI 305 Standard for Personal Care Products Containing Organic Ingredients. It is one of the best organic baby lotions around for providing help to dry, eczema and sensitive prone skin. It has no harmful chemicals or ingredients which allows you to be comfortable when applying this lotion to your baby’s body, knowing it is safe for their delicate skin. The location can be used for nappy rashes, dry skin, rough matches and general everyday moisturizing. Earth Mama have understood that what is put on your baby will go in your baby which is why they have made all their lotions with extra care ensuring there are no harmful chemicals and fragrances. The Earth Mama Organics Baby Lotion is available in bottles up to 8 fl. OZ which is quite small when using every day. You are likely to run out quickly when using this baby lotion daily and therefore it can become quite expensive to keep stocked up with this organic baby lotion. The lotion is available on Amazon for $16.40 for 8 fl. OZ and is worth the extra few dollars if you are looking for an organic baby lotion for delicate baby skin. Why we like it: Johnson’s is a classic, worldwide renowned company that provides one of the best baby lotions on the market. The worldwide success is due to the fact that their products work and work well very well in fact! Johnson’s products are clinically proved and tested by dermatologists to ensure the lotion is of high quality and works well for baby’s with delicate skin. The baby fresh scent leaves a lovely smell on your baby’s skin which is lovely after a bath. The lotions ingredients help to keep the skin nourished and soft, this is particularly important after a bath so all moisture can be contained in the skin. Johnson’s baby lotion is a great choice for an every-day baby lotion to keep your baby soft and moisturized. 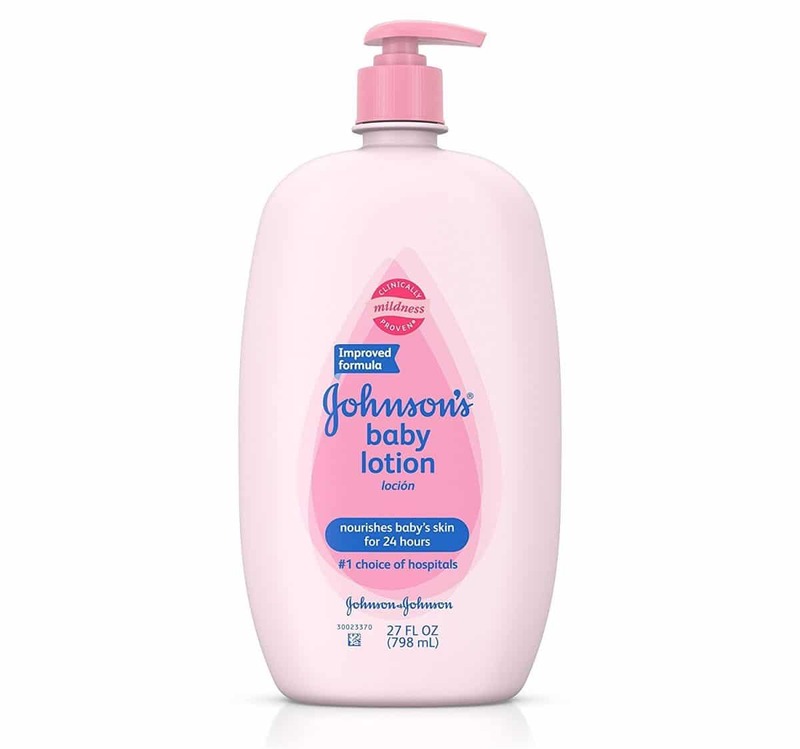 Johnson’s Baby Lotion is the number one choice for hospitals and provides nourishment for baby’s skin for 24 hours. The lotion has been tested by clinical dermatologists and provides a mild lotion for your baby’s skin. Perfect for an everyday lotion, Johnson’s baby lotion is hypoallergenic and very gentle for newborn babies and helps to soften and soothe skin. The lotion combines key ingredients that help your baby’s skin to be soothed and help to relieve any dry skin. Johnson’s Baby Lotion is an affordable baby lotion that is available in all supermarkets, baby and pharmacy stores and online. Available for just $5.87 on Amazon for a 27 fl. OZ bottle, Johnson’s have provided an affordable baby lotion for all consumers. More than 85% of Amazon customers have left 4 to 5-star reviews showing the product is go high quality and worth the great low price. Why we like it: The Burt’s Bees Baby Bee Nourishing Lotion is made from 98.6% natural ingredients providing a safe and natural lotion for your baby’s skin. Proving moisture for up to 24 hours means you only have to apply the lotion once a day and your baby will be good to go. The lotion is free from harmful ingredients including paraben, petrolatum, phthalate and the fragrance in this product is from natural sources so it does not cause irritation. Natural products are the best choice for baby lotions to make sure that there is less risk of irritation and harmful side effects. As the Burt’s Bees Baby Bee Nourishing Lotion is a natural lotion with 98.6% natural ingredients, the performance of lotion is great and will not be harmful to your baby’s skin. The lotion helps to moisturize delicate skin as well as protecting it from dryness by locking in the moisture. Natural ingredients include aloe and shea butter which help to naturally moisture babies skin and the lotion is hypoallergenic and safe for use all over the body and face. With no harmful ingredients such as paraben or phthalate, this lotion is ideal for delicate skin. It has been clinically proven to be a safe lotion for sensitive baby skin and an effective and non-irritating product to help nurture your baby’s skin. For $11.99 on Amazon, you can buy a 0.9-ounce bottle of the Burt’s Bees Baby Bee Nourishing Lotion which is fragrance-free. Burt’s Bees is a company that has a wide range of naturally made products and their prices are slightly above average. However, if you are looking for all natural ingredients in a baby lotion, Burt’s Bees provides this. The product is still affordable, it just appears more expensive in comparison to other baby lotion products. Why we like it: Puracy Organic Baby Lotion is the 2018 award winner of the best baby skincare from the Bump, suitable for all skin types the lotion developed by doctors provides moisturisers for children of all ages as well as adults. The organic lotion has a 3rd generation formula which includes a blend of lavender and pink grapefruit essential oils as well as plenty more certified organic ingredients. Shea butter, vitamin E and shea butter all help with a non-greasy and light lotion that provides hydration for 24 hours. Puracy Organic Baby Lotion has a 100% satisfaction guaranteed. The plant-based, vegan and hypoallergenic lotion is made in the USA and helps to nourish babies skin for up to 24 hours, even after a bath! The lingering smell of pink grapefruit and lavender will make your baby even more irresistible to cuddle. the 99.95% natural, an organic product can be used on all skin types for everyday use. Whether your baby has dry or sensitive skin, eczema, nappy rash or just needs extra soothing after a long bath, Puracy can provide this. The lotion provides a calming and gentle moisture for baby’s which is non-toxic and has scents of lavender and grapefruit. Puracy is available on Amazon for $12.64 for a 12 fl. OZ bottle which is a mid-range price for a baby lotion for newborns. Organic and all natural products are often more expensive because they contain ingredients that are harder to gather and make. Puracy products contain renewable ingredients which are natural and free from harmful chemicals and animal-based ingredients (vegan-friendly). Why we like it: Scents of lavender an chamomile is what you’ll get with the Baby Magic Calming Baby Lotion. This lotion is rich and non-greasy, enriched with vitamins and absorbs quickly into your baby’s skin. Baby Magic Calming Baby Lotion has been tested by dermatologists and perfect for use after your baby’s bath. Moisturising your baby after a bath is essential to retain their moisture, by using this baby lotion you can moisturize and clean your baby’s skin. The lotion is easy to apply, absorbs quickly and gives off a lovely baby scent of lavender and chamomile that moms love. This baby lotion provides a rich and non greasy application on your baby’s skin. It quickly absorbs into their skin and is enriched with vitamins and aloe to help soothe the skin. The product has been tested by dermatologists and is hypoallergenic so it can be applied to all skin types. There is nothing better than smelling your baby after a soak in the bath and once applying this baby lotion they will smell even more magical. The lotion is a great help if your baby has sensitive skin as the lotion will help soothe and moisture the skin. 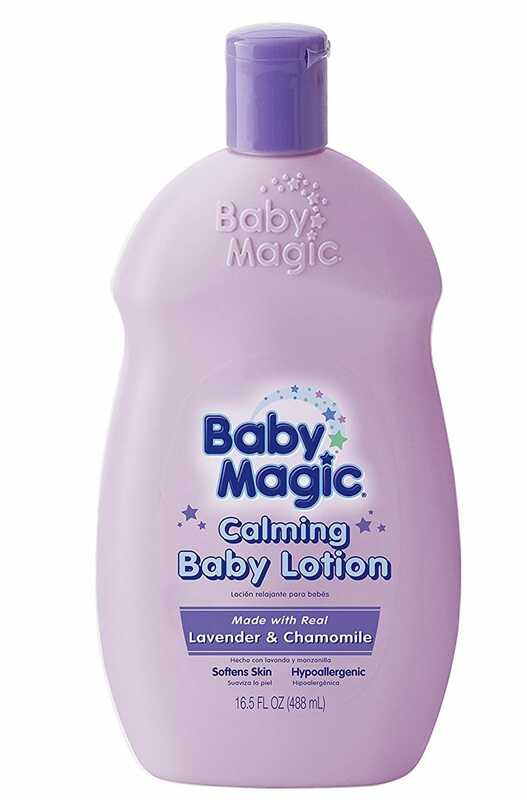 Baby Magic Calming Baby Lotion is a very affordable product for use on babies of all skin types. The baby lotion is available on Amazon for $4.42 for 30 fl. OZ which is a great price. The large bottle will last a while and an inexpensive purchase to help your baby’s skin, moisture, and hydration. Made with real lavender and camomile, this product will help soften skin and is definitely great for the money/price on offer if you’re looking for a new baby lotion. Choosing the right baby lotion for your new baby is very important to ensure you find the right lotion to match your baby’s skin needs. It may take a few tries and lots of reading and research but it will be worth it in the end when you find a baby lotion that helps to keep your baby’s skin moisturized and help get rid of irritations. There are lots of factors to consider when choosing what baby lotion to use and it is important you find the right one to suit your baby’s skin to provide the best care for their sensitive skin. Baby’s skin needs lots of moisture as it can become dry and problematic very quickly. The main use for baby lotion is to help retain moisture in the baby’s skin (this is especially important after baths) and to protect their skin from sensitivity. All baby’s skin is different and it will be down to skin type and personal preference on which baby lotion you choose. As there are so many different baby lotions available on the market, you might struggle to know where to begin when choosing a baby lotion. So it is important to have a number of factors in mind that you want your baby lotion to have, this will help narrow down your choices. These factors could include natural or organic lotions, hypoallergenic, free from specific ingredients and fragrance-free. When choosing a baby lotion there are a number of things to consider to make sure you use the right one for your baby’s skin. Newborn babies often don’t develop allergies until they are much older however it is important to check in case your baby has already developed a severe allergy (nuts, dairy etc.). To be on the safe side, it is often advised to use ‘hypoallergenic’ products for babies so that allergenic reactions don’t occur. With products such as baby lotion there are lots of ingredients and if you were to use a hypoallergenic lotion and your baby had an allergic reaction, it would be quite difficult to figure out what it is. Choosing a hypoallergenic product gets rid of this problem for you, as babies skin is super sensitive anyway, it makes sense to cut down as many possibilities of rashes and skin complications as possible while they are young. Although this is not the only way that baby lotions are made, a vast majority of baby lotions use lots, if not all, natural ingredients. As your baby’s skin is so sensitive, any chemical or strong ingredient could cause a reaction. This is why a lot of baby lotions are using a large percentage of natural ingredients which are too harmful to the skin and often help soothe and moisturize the skin. Natural ingredients including lavender, camomile, shea butter, honey and vitamins which all have unique benefits when applied to your baby’s skin. It is important to check if the baby lotion you are deciding to buy and use on your baby’s skin is free from nasty ingredients and chemical. If a baby lotion is full of harmful chemicals then it is most likely going to harm your baby’s skin on the outside and also cause trouble inside the body. Many of the popular baby lotions are free from paraben, mineral oils, phthalate and fragrance to ensure they are less harmful to the babies skin. The price of baby lotion is also an important factor to consider when choosing the right baby lotion. As you can see from the top 10 that the price and size can differ a lot between different brands of baby lotion. If you’re planning on using the baby lotion daily then you will have to take this and the size bottle you choose into account so that you don’t run out quick and have to buy baby lotion often a more than average price. But always remember that baby lotion is to be used on your baby delicate skin so choosing the right baby lotion is important. The less harmful and more gentle the baby lotion, the better it will act on your skin. Hypoallergenic means the product has been designed not to cause irritations. It may not be allergy free and gentle for all skin types however it provides a reduced risk of a possible allergic reaction. Baby lotion doesn’t have an expiry however like all profits contain active ingredients after a few months (once open) they will not be as good as they were when you first used them. Baby lotion is likely to not lock in as much moisture or hydrate as well. However, if the baby lotion has been around for 2 to 3 years it may be a good idea to throw it away and buy a new one. Essentials oils are natural oils that have been derived from a plant or another natural source and usually distilled into an oil form. They are usually added to baby lotion to add a soothing feeling and nice scent to the product, this includes lavender and chamomile. Baby lotion that helps to moisturize the skin will contain oil of some sort which helps to hold onto the moisture in your baby’s skin and help improve the skin’s barrier. Whereas hydration occurs when extra hydration acid is absorbed by the skin. If your baby has a rash, burn or skin irritation of any kind then baby lotion is advised to help this. Baby lotion can be applied whenever you feel suitable but is particularly advised as a daily moisturizer and after your baby’s bath to help lock in moisture.